If you follow me on Instagram (@beautyfromtheshire) you'll know that I recently spent a few days in London and picked up some beauty bits that I've been wanting to try for ages. 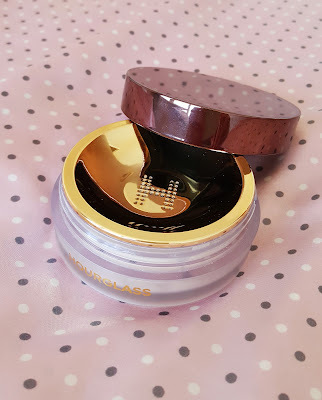 The Hourglass Veil Translucent Setting Powder was one of them as I'd heard such good things about it from other bloggers and after two weeks of thorough testing I'm ready to share my own thoughts. The Hourglass Veil Translucent Setting Powder is described as a weightless translucent powder which blurs imperfections and minimizes the appearance of pores and fine lines all whilst setting your makeup. The formulation is talc free and contains diamond powder to refract the light for a soft-focus finish. It is suitable for all skin tones and types but will obviously be particularly good for those who are combination or oily. I have combination skin with an oily t-zone and have to use a powder to set my foundation or it starts to break down around my nose and chin after only a couple of hours. Also, we are currently in the middle of a heatwave in the UK so I've had the perfect conditions to really put this product to the test. I dust it lightly over just my t-zone with my Spectrum Collections A04 Tapered Finishing Brush. The powder is dispensed out of the tiny holes which make up the letter H and the lid is cleverly designed to not let powder go everywhere when it's closed meaning that you to use the perfect amount every time. I've been testing the Hourglass Veil Translucent Setting Powder for about two weeks now and I'm really impressed. It instantly knocks back any unwanted shine but is barely detectable on the skin. It doesn't cling to my foundation and make it look cakey or sit in fine lines like so many powders do. I still need to blot in the middle of the day but then it doesn't claim to control oil production. At the end of a day at work my foundation hasn't broken down in the usual areas as much which is really saying something with the meltingly hot weather we've been having. It does all of this without looking really flat and matte so I'm going out on a limb and saying that I think even previous powder haters could be converted by this. This was my first Hourglass purchase but it definitely won't be my last. At the time of writing the Hourglass Veil Translucent Setting Powder is £36 HERE. It also comes in a cute travel size for £14. The Spectrum Collections A04 Tapered Finishing Brush is £7.99 HERE.